There is an interesting story in the Matsya Purana which narrates about a curse which made Hindu God Vishnu to be born on earth as incarnations or avatars and suffer pains and human emotions. Legend has it that the Devas (Demi Gods) were able to continuously defeat the Asuras (Demons) in battle. Fed up with this humiliation, the Guru of Asuras, Shukracharya went to pray to get the Mritasanjivani Mantra which will make the Asuras invincible. Shukracharya asked the demons to take refuge at the Ashram of his father, Sage Bhrigu, while he was away. Devas led by Indra found out what Shukracharya was up to. So they decided to attack and finish off the demons before the sage receives Mritasanjivani Mantra from Lord Shiva. When Devas reached the ashram of Sage Bhrigu, the sage was away. They thought this as the right opportunity to attack the demons. But the wife of Sage Bhrigu and mother of Shukracharya came to their rescue. She used her powers and made Indra, the king of Devas, immobile. The strange site unnerved the Devas and they took refuge at the feet of Lord Vishnu. They asked Vishnu to help them. Vishnu then asked Indra to enter his body so that he can be rescued. But Shukracharya’s mother warned that he will burn both of them into ashes. This angered Vishnu and he used his Sudarshana Chakra to severe her head. When Sage Bhrigu returned he saw the severed head of his wife. Upon hearing what had happened from the demons, an angry Sage Bhrigu cursed Vishnu to be born on earth several times and suffer the pains of death and worldly life. 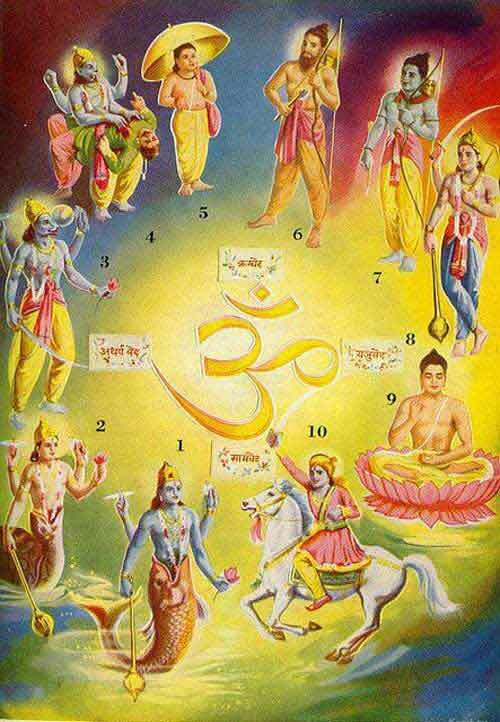 Vishnu then took several incarnations to fulfill the curse of Sage Bhrigu and to restore Dharma on earth. The wife of Sage Bhrigu was cursed in the previous birth that she will attain Moksha when she will die at the hands of Sri Hari Vishnu. She was thus relieved from the cycle of birth and death. Please note that there several versions of this story. The leelas of Bhagawan are beyond human imagination and thinking. Each incident has a reason and only Bhagavan knows it all.